I'm getting ready to work on a big Flickr project, and I'd love to hear about your favorite features and your best tips. What do you like best about Flickr? 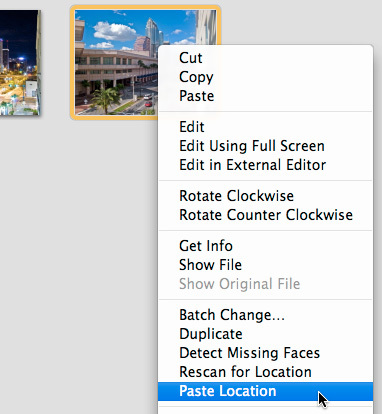 Do you use any tools with it, such as plug-ins for uploading? Have you learned any helpful techniques that you're willing to share with others? If you have answers for any of these, please post a comment below (only hit the Post button once, it takes a couple minutes to process), or chime in on the discussion page of The Digital Story Public Group. I've already set up a thread there. You can also send you thoughts directly to me, if you're more comfortable with that. Contact information is on our Submissions page. 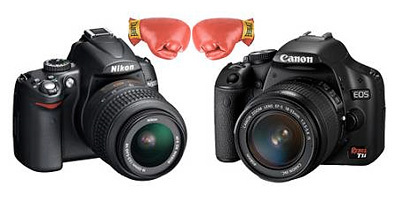 Wondering which of the new offerings might be best for you: the Nikon D-5000 or the Canon EOS Rebel T1i? Well, Cameratown has just published their Nikon D-5000 vs. Canon EOS Rebel T1i Feature Comparison Chart. 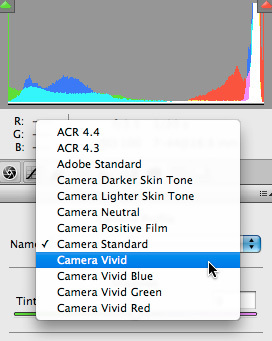 How does HD video capture stack up? 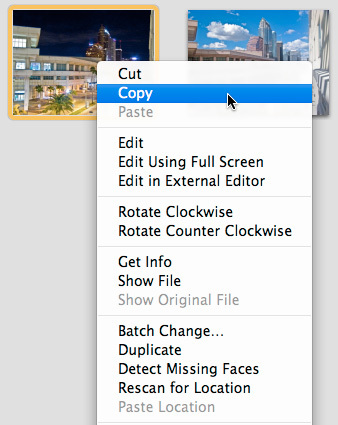 Resolution? LCD display? Burst rate? The chart reveals all. When Max and Zach invited me to a "behind the scenes" tour with their mom at the Redwood Empire Food Bank in Santa Rosa, I jumped at the opportunity to learn more about one of my favorite non-profits in Sonoma County, CA. The boys had raised $135.80, and wanted to hand it over personally to Miriam Hodgman, the Food Drive & Event Coordinator for the organization. What I learned during my visit is that this food bank provides assistance to more than 60,000 hungry people a month, distributing over 10 million pounds of food a year. 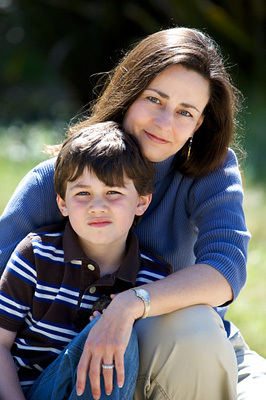 Forty-two percent of the funding comes from individuals like Max and Zach. One program that caught my eye is called "3 Squares." For less than $4, the food bank can provide 12 meals for a family of four. 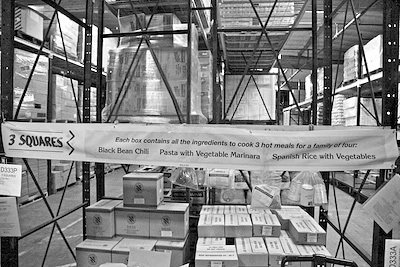 The boxed meal includes all of the ingredients for entrees such as Black Bean Chili or Spanish Rice with Vegetables. I was struck by the fact that so little money could make such a big difference. If you're looking for a way to help others who may be struggling right now, consider contacting your local food bank. They are experts at bringing together resources from businesses, individuals, and charities to provide immediate relief to hungry people. There are no qualifications required to receive help. If someone is hungry, they will receive food. You can learn more by visiting the Redwood Empire Food Bank web site. There's lots of good educational information there. Photos from top to bottom: Top-The 3 Squares program with boxed meals ready to deliver. 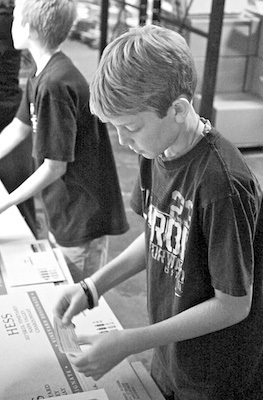 Middle-Max applies a label to a 3 Squares box. 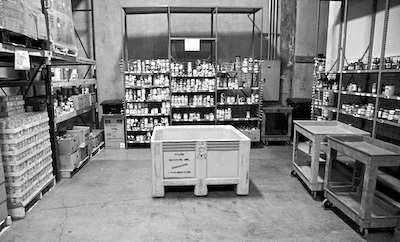 Bottom-One of the many areas of the Food Bank where supplies are organized. Pictures by Derrick Story, captured with a Canon 5D Mark II. The planets appear to be aligning for the release of the third generation iPhone this summer. Of particular interest to our community are the rumors of a larger image sensor that supports up to 3.2 megapixel still captures, and the ability to record video. If indeed we see these upgrades, then the iPhone stands to move forward as the "camera you always have with you." Combined with the already useful network connectivity and plethora of photography software via the App store, you could find yourself reaching for your smartphone first in picture taking situations. I predict we would see more candids and grab shots captured with an upgraded iPhone. We should know more this coming June. 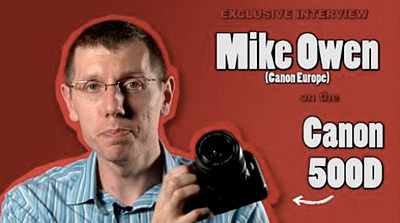 Terrific video by PhotoAnswers where Canon Product Manager Mike Owen discusses the new Canon T1i (500D). In short, the combination of attributes including affordable price, high resolution LCD, HD video recording, and high ISO -- all crammed into a compact package, make the Rebel T1i a tempting DSLR. You'll have even a harder time resisting after watching this video. I was up on the second floor talking with a senior clerk in Housewares who had just found out she was going to lose her job. 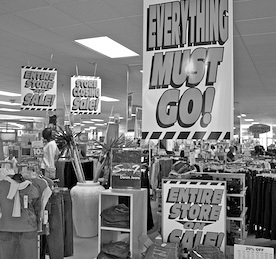 This was the first week of liquidation at the Gottschalks department store in Santa Rosa, Ca. She had worked for the company for more than 5 years. "Mostly, I'm just mad." she replied. "I just hate seeing this happen here. And I don't want to lose my job." She said this as she kindly helped me with a small purchase during our conversation. By way of background, I learned that: "Gottschalks, founded in Fresno in 1904, operated 58 department stores and three specialty stores, including locations in Santa Cruz and Watsonville. It had about 5,200 employees in California, Oregon, Washington, Alaska, Idaho and Nevada," wrote Tim Sheehan of The Fresno Bee. 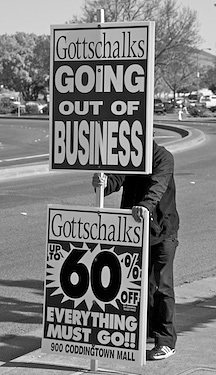 "Gottschalks filed for Chapter 11 bankruptcy in mid-January in hopes of either reorganizing its debt or finding a buyer." But unfortunately neither plan worked and they had to turn over their business to a liquidator. The sequence for closing a large retail store this way is predictable, almost mathematical. First, the liquidator moves in and takes over the operation. Initially, they may actually raise the prices. For example, while I was in Gottschalks, I overheard one customer commenting, "I was here last week and this set of dishes was on sale for 40 percent off. Now they're only 20 percent discounted." This also happened with a Circuit City store closing (as reported by Ira Glass in This American Life). The liquidators raised prices at the beginning of the closing to get as much money as possible, then slowly deepened the discounts as inventory dwindled. Even though the signs outside tempt shoppers with savings up to 60 percent, they most likely won't see that level of discounting for weeks. Meanwhile, inside on the second floor in Housewares, I feel the eerie sensation of death. I know that soon everything I see here will be gone. Out of the corner of my eye I notice another clerk who had given me a great deal on a major purchase months back. I had this fleeting thought that maybe I had taken advantage of him, and now he was certain to lose his job. "These are good people," blurted the woman who was helping me at the counter. "I've really enjoyed working for this company." She then carefully finished wrapping my purchase and wished me a good day. "Best of luck," I said, and took the escalator back down to the first floor, knowing this will be my last visit to Gottschalks of Santa Rosa. Photos by Derrick Story with a Canon 5D Mark ll and a Canon 24-105mm f/4 lens. Images processed and converted to B&W in Aperture.